Ryan relocated to Duke to finish his fellowship. As a first time home buyer, I had many questions about so many different home-buying topics and Stacie Dye not only covered them all without hesitation, she put me completely at ease throughout the whole process. She provided excellent advice on various aspects of finding a home, negotiating the price, and completing the closing. I truly had a strong advocate on my side throughout the process and the results turned out to be fantastic, with the purchase of my new dream home. 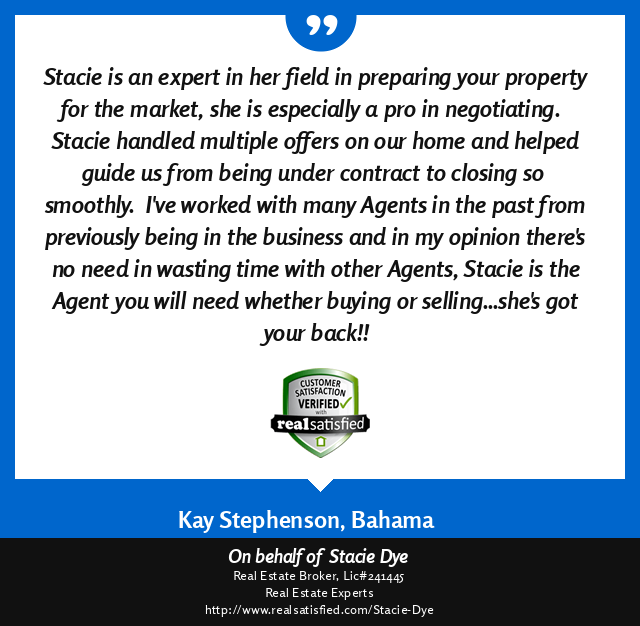 Stacie Dye is a true professional who I would recommend with strong enthusiasm to anyone selling or buying a home. Tom saved his sign rider for a memory. compare. Prepare for the interviews and ask your key questions, and pay close attention to both the answers and the way in which your questions are addressed. This person is going to assist you through a stressful period. Is (s)he going to add to or alleviate your stress? Are your questions being heard, and are they being answered? Don't forget who's working for whom. Your realtor will have suggestions and recommendations, but ultimately it's your house, your sale/purchase. Beware the realtor who talks and does not listen. specifically that my last house sold on the day it was listed. I challenged them to top that. They promised that they would do their best. The interview was thorough and illuminating. A lot has changed since 1999, notably including the ways in which housing is marketed (notably due to the Internet), and the expectations of buyers with regard to the staging of a house, regardless of whether it's a buyer's or seller's market. At the initial interview Stacie and Kay outlined generally the state of the market at that time and place, and provided a cogent assessment of the strengths and weaknesses of my house. They then worked up a detailed and specific analysis with a suggested selling price, and then patiently addressed my questions and concerns, as well as making specific suggestions on what else needed to be done prior to putting the house on the market. Of course they provided clear context in terms of comparables on the market. I believe every sale involves compromises. I had prepared the house as best I could in the time available but chose ultimately to enter the market at a point in time rather than holding back until I was able to complete improvements. Stacie and Kay were entirely accommodating in that decision, while another candidate I interviewed was not. Interestingly, the asking price that Stacie and Kay suggested was about 6% higher than that recommended by the other candidate, without "demanding" I complete additional improvements to prepare for going on the market. Conclusion: Stacie and Kay did not low ball the price in order to achieve a quick sale, nor require endless improvements in order to further ease their job of achieving a quick sale. Instead they took the house as it was, and worked to make the most of it. arrived on time, left on time, and produced an amazing ensemble of photos that formed the backbone of the individualized website for the house sale. individuals driving by the house until the day I moved, and the weekly statistics that Stacie sent on web traffic showed ongoing interest. utmost integrity, listening to my concerns, commenting on my analysis, offering advice, and ultimately going along with my direction on how to proceed in the negotiations. In the end the sale closed successfully. My only regret is that neither Stacie nor Kay is willing to relocate to Canada, so I'm once again in a position of having to find a realtor if ever I need those services. Vicky & Jay needed to purchase in a 3 day visit due to a job relocation to RTP and the sale of the their home. 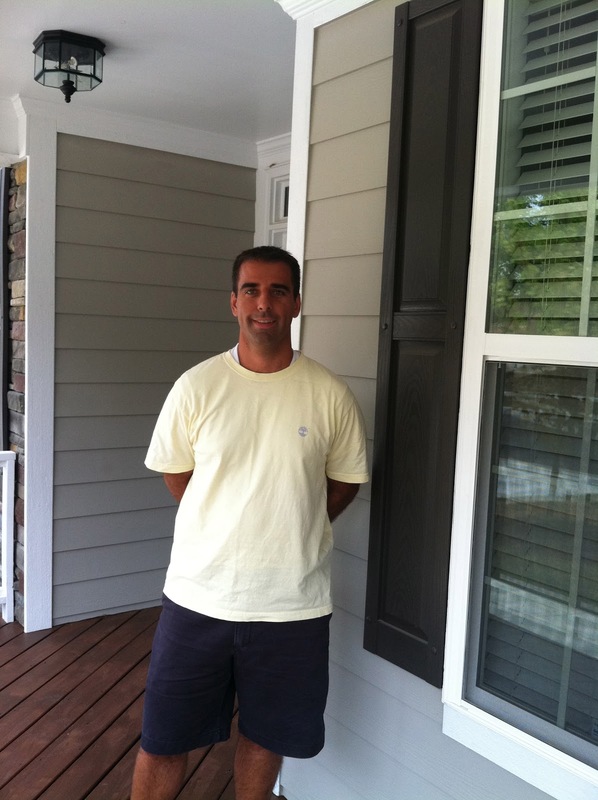 Dr. Albert owned a property that his son lived in while attending Duke. After his son graduated we marketed the property for investors. I want to thank you for going above and beyond anything I expected. Your patience, support, positive attitude and guidance throughout the sale of my home was everything I could have hoped for in an agent. Beyond that, due to personal circumstances I have asked you to help me acquire information even after the sale. You responded without hesitation, although is was clearly, "not in your job description'. This degree of customer service speaks to your character and integrity and for that I am grateful. Danner is a Nurse Manager at the VA Hospital. She purchased in a historic area close to Downtown Durham. 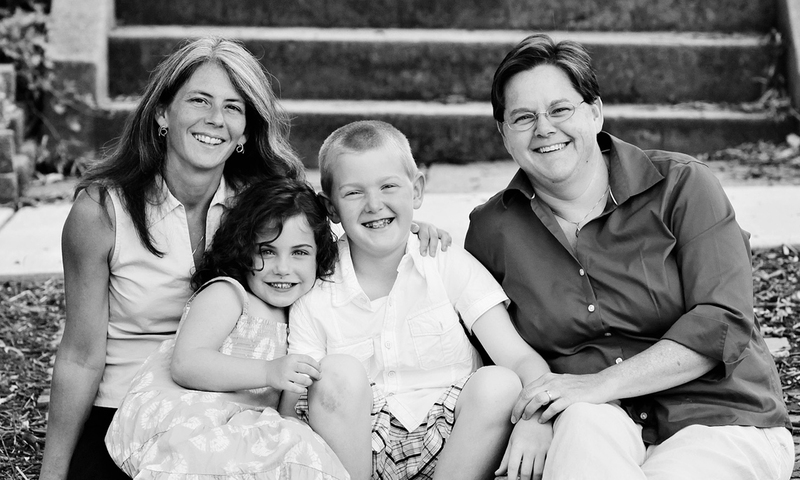 Buying my first home through Stacie Dye was seamless and rewarding. Her knowledge guided me through very foreign territory and her attention to detail didn’t go unnoticed. I will continue to rant and rave about what an excellent realtor she is to work with and have gained a true friend in the process. Stacie you are a truly one of a kind! Stacie took the time from the beginning to discuss my past experiences with Realtors and made sure that my priorities were her priorities. We all know that buying or selling a house can be the one of the most stressful times in a person's life.Whenever my personal stress level has risen, Stacie always kept me cool and kept focused on our goals and objectives for the purchase. 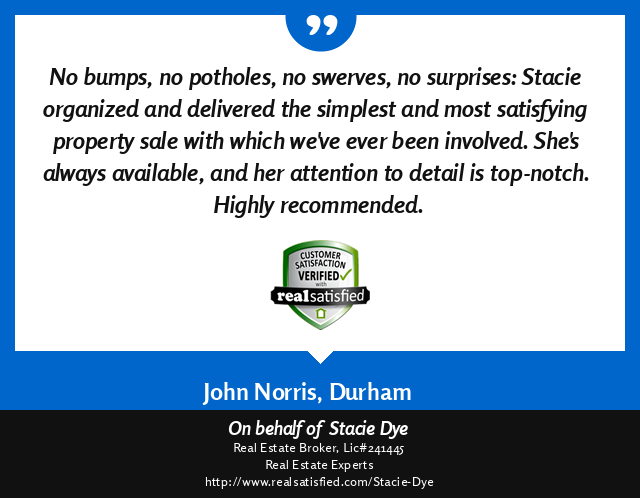 I have in the past and will continue to recommend Stacie to everyone looking for an exceptional realtor. Even 10 years after our home purchase, we still had nightmares about our last real estate agent. So when it became clear we were going to have to move, we were just going to go it on our own. But when I met Stacie at an open house, I had to reconsider. She was a breath of really needed fresh air. And that was the way it was all the way through our relationship with her. She always knew how to help us even when we didn't know we needed any help. Stacie has been a part of some of the biggest changes in our life together as a family-- deciding to leave the home where we brought our children home from the hospital when they were born, the house of their first steps and of their first words; helping us find the home of their future, the house of driving lessons and first dates, the house where they will figure out how they will change the world; and helping my parents find a new home in Durham where they can retire and be with their grandchildren. Its been almost two years now, but I still have Stacie's number in my phone. She is the first person we send everyone to when they have any real estate needs. We are so fortunate to have found her. I just wanted to thank Stacie "On Air" as it were for her help in getting my mom's property sold last August-September. If you have had to deal with realtors in a long distance business relationship, you know it can be a scary thing. Stacie actually was the only one of many I had asked to take on the challenge. As well, she contacted me regularly to keep me abreast of our progress in where we were on selling the property. For some reason, it is a rare thing for people to have the common courtesy to simply call you back. Not Stacie. 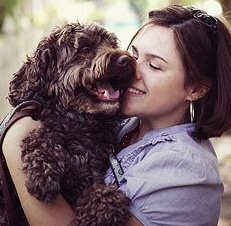 Through it all she was courteous, and professional without being overly stuffy. When things got a little scary she went above and beyond and went out on a limb for us and took "ownership" of the situation. A rare thing in any business. But I will leave that story to her. Thank you Stacie, you are a rare bird. Stacie helped my wife and I with the purchase and sale of our first home. 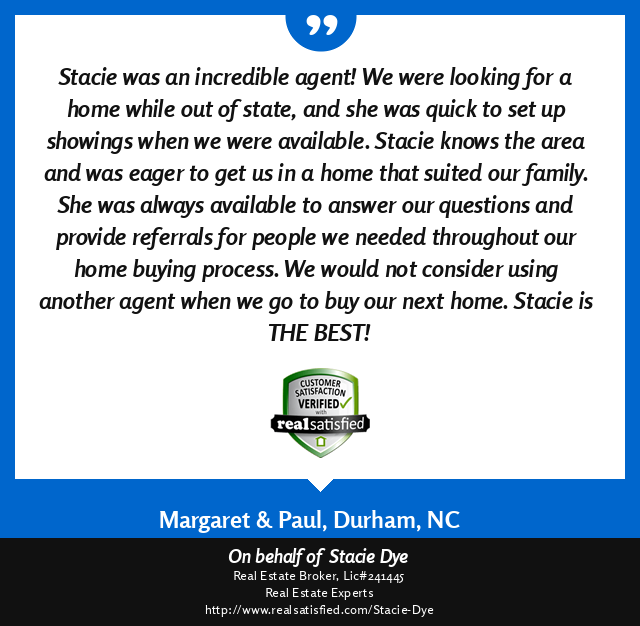 When purchasing, we were up against competing offers and Stacie handled everything, including working with two real estate rookies, perfectly. She was knowledgeable, a joy to work with and she worked very hard for us. Our intentions were to live in Durham long term but then I got a job opportunity in another state that was closer to our family. We decided to move and needed to do so quickly. I called Stacie and the process began. Within in a few days we agreed on a listing price, staging, professional pictures were taken, the home was measured and we hit the market. I wanted our home to be on the market in time for Duke's Match Placement. We went live in 3 days and had a offer in 2 weeks. 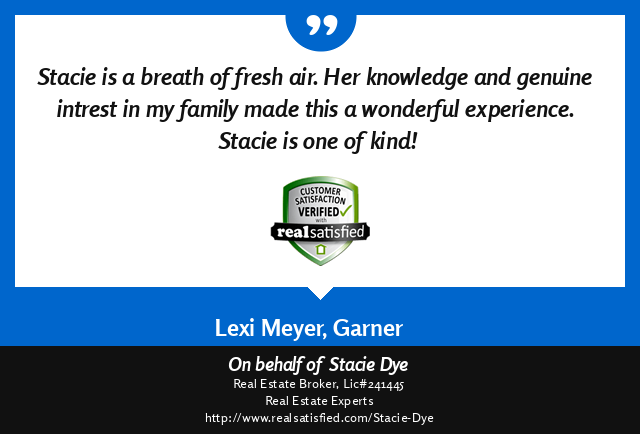 I highly recommend Stacie for all of your Real Estate needs.